1. NAME The corporation shall be known as the National Association for Rights Protection and Advocacy (hereinafter called NARPA). Promoting alternatives to coercive and harmful practices in order for the right to choice to be meaningful. 1. 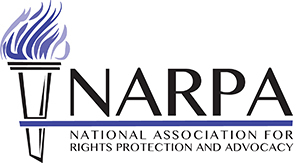 MEMBERS Anyone interested in promoting the goals of this organization can become a NARPA member by being in agreement with our mission statement, having attended at least one annual NARPA conference and paying a fee to be determined by the Board of Directors. Membership will not be restricted in any way because of race, national origin, sexual orientation, gender identity, disability, age, residence, diagnosis/label, military status or gender. Membership may be granted as an honor to individuals active in the field of rights protection by the Board of Directors. 2. VOTE At meetings where votes are taken, each member shall have one vote. In order to be eligible to vote at such meetings, members must have previously met requirements for membership. members may vote via email to the Secretary. 3. GROUP AFFILIATION Any group of citizens organized specifically as a NARPA affiliate, as well as any group of citizens organized for another purpose when such purpose is compatible with the goals and purposes of NARPA, may apply for affiliation. The Board shall determine standards and conditions of affiliation. Upon approval by the Board and payment of a yearly affiliation fee determined by the Board, based on the applying group's annual budget and such other factors as the Board may establish, the group will become an affiliate. This Board approval will be by a vote of at least 2/3 of those Board members voting plus one. Each affiliate will be entitled to identify itself as a NARPA affiliate. However, no affiliate will be entitled to act or speak in the name of NARPA except in supporting a position previously adopted by NARPA or as specifically authorized by the Board. The Board may disaffiliate a NARPA voting affiliate by vote of at least 2/3 of those Board members plus one, based upon actions by the affiliate not compatible with the goals and purposes of NARPA or the conditions or standards of affiliation. Individual members of affiliate organizations may become members of NARPA upon payment of the annual membership fee, less a percentage determined by the Board of Directors. An affiliate organization may pay the membership fees for its members, but only the individual members are entitled to vote. 1. BOARD OF DIRECTORS The general management of the day-to-day affairs of NARPA shall be invested in the Board of Directors who shall be elected as provided in these by-laws. The number of directors shall be up to 17. A majority of the Board of Directors must concur in any decision requiring Board action. At least two (2) members of the Board of Directors shall be persons who have been patients or inmates in a facility for people labeled mentally ill or developmentally disabled. At least two (2) members of the Board of Directors shall be persons of color, one of whom shall have been a patient or inmate in a facility for people labeled mentally ill or developmentally disabled. The election process for electing the Board of Directors shall not discriminate on the basis of race, religion, national origin, sexual orientation, gender identity, disability, age, residence, diagnosis/label, military status or gender. 2. OFFICERS The officers of NARPA shall consist of a president, vice president, secretary, and treasurer elected from the Board of Directors. At the discretion of the directors the positions of secretary and treasurer may be merged into that of secretary-treasurer. 3. MEETINGS OF THE BOARD OF DIRECTORS The Board of Directors will meet at least semi-annually, in person if possible or by telephone conference or mail if necessary. Such meeting shall be held after fourteen (14) days notice to all members of the Board. Special meetings of the Board may be called by the president or by at least 1/3rd of the Board members. Notice of the time and place of that meeting shall be mailed to each Board member at least fourteen (14) days prior to the meeting. It is the responsibility of each member of the Board to provide current contact information to the Secretary. 1. ANNUAL MEETING OF MEMBERS NARPA shall hold a membership meeting each year or at longer intervals, if necessary, as agreed to by the Board at a time and place to be announced. This will normally occur at the same time and place as the Rights' Conference. For issues upon which there is a vote, a member may vote in person or may vote by proxy, except that no proxy shall be voted unless carried by a member of NARPA and each member may cast no more than two proxy votes. Members may vote by email to the Secretary. 2. QUORUM At least 1/4 of the members, represented in person or by proxy, shall constitute a quorum at the annual membership meeting and the affirmative vote of a majority of the members present at such meeting shall be necessary for the adoption of any matter voted upon by the members. 3. RIGHTS CONFERENCE NARPA shall hold a rights conference each year or at longer intervals if necessary. The time and place shall be selected by the Board of Directors. Selection of the site shall consider movement to different parts of the country. The Board shall appoint a Conference Chair to assume responsibility for the conference. It is preferable that the Conference Chair reside in the same region as the conference site chosen by the Board. 1. SELECTION OF DIRECTORS The Board of Directors of NARPA shall be elected by a majority vote of the other members of the Board of Directors at the annual meeting. Such election shall consider geographic distribution. Directors must be members of NARPA, Candidates must have attended at least one previous Rights’ Conference. Election to the Board of Directors will not be restricted in any way because of race, religion, national origin, sexual orientation, gender identity, disability, age, residence, diagnosis/label, military status or gender. 2. TERMS OF DIRECTORS Directors may succeed themselves in office. The term of office is three years and may succeed themselves for one additional term. After serving a full two terms an individual must wait at least one year before rejoining the Board. Board member terms of office are staggered so that approximately one-third of the Directors terms expire each year. 3. NOMINATION AND ELECTION OF DIRECTORS Upon expiration of a Directors’ three year term, remaining members of the board of directors shall vote to fill the vacant position at the annual meeting. Members of the Board whose terms have expired may succeed themselves for one additional term, subject to confirmation by the Board by majority vote using paper ballots or voting by email to the Secretary. Nominations of individuals to fill a vacant position may be made by any member of NARPA. A Nominating Committee shall be established to suggest potential Board members. Any NARPA member can nominate an individual for membership. Members can self-nominate. Nominations shall be made to the Nominating Committee at least 14 days prior to the Annual Conference. Five days prior to the annual conference, the Nominating Committee shall submit to the full Board a list of suggested members double the number of vacant positions. Voting shall be by paper ballot and the secretary shall tabulate the results. Board members may vote electronically. Individuals receiving a majority of votes cast will be considered elected to vacant positions and begin a three year term effective immediately. In the event there is no majority, a second round of voting shall be held. If no decision can be made because of a lack of a majority, the President shall cast the deciding vote. 4. ELECTION OF OFFICERS Nominations for officers shall be made at least 24 hours in advance of the election meeting, which will be held during the Annual Rights Conference, unless a resignation occurs. Directors can self-nominate for officer positions. Voting shall be by paper ballot, however electronic voting shall be permitted in the event that Directors are unable to attend. Selection of officers shall be a majority of votes cast. If only one nomination is made for an officer position, by motion, voting can be by acclamation. Officers shall be selected prior to selection of new Board members. 5. RESIGNATION An officer or board member may resign at any time by giving thirty days written notice to the Board of Directors. Vacancies shall be filled by the Board; the term of office for such person appointed by the Board is to run for the remaining portion of the term of office of the resigning officer or director. 6. REMOVAL OF DIRECTOR OR OFFICER A director or officer may be removed with or without cause by a vote of 2/3 of the directors holding office, provided prior notice shall have been given to all directors at such meeting called for the specific purpose of considering the removal of a director or officer. 1. PRESIDENT The president shall be the principal officer of NARPA and shall be responsible for day-to-day operation. The president shall preside over all board meetings and perform such duties and exercise such power as expressed or implied in the Articles of Incorporation and by these by-laws, as may be necessary and proper to carry out expressed and implied duties. The president may appoint such committees as may be necessary and shall with the approval of the Board of Directors fix the compensation of all employees. The president shall have served on the Board of Directors for at least one year. 2. VICE PRESIDENT As the Board may deem necessary, there may be one or more vice presidents. In the absence of the president, the vice president shall perform duties of the president and in the absence of both president and vice president, the secretary shall assume the duties of the president. 3. SECRETARY The secretary shall keep the minutes of all meetings of NARPA and of the Board of Directors and shall, if requested, read such minutes for approval. The secretary shall keep or cause to be kept at the principal office or at such place as the Board of Directors may order, a book of minutes of all such meetings of NARPA, the Board of Directors and of its members. 4. TREASURER The treasurer shall have charge of all receipts and monies of NARPA, deposit them in the name of NARPA at a bank approved by the Board of Directors, and disburse these funds as authorized by the Board of Directors, or as directed by the president. The treasurer shall be responsible for the timely filing of all forms required by law of nonprofit corporations to retain its tax exempt status and, in addition, the treasurer shall keep regular accounts of receipts and disbursements and of the properties or business transactions, if any, of NARPA. 5. CONFERENCE CHAIR The conference chair shall be responsible for all aspects of the rights conference. The president shall supervise the activities of the conference chair. A separate budget for the conference chair may be approved by the Board of Directors. 6. EXECUTION OF INSTRUMENTS All instruments obligating NARPA to amounts in excess of $5,000 and all grants involving more than $5,000 shall be executed by the president on behalf of NARPA, only after an approval of the majority of the members of the Board of Directors. Such approval may be given by telephone, personal meeting or by writing. All leases shall be executed by the president only upon a prior authorization of a majority of the Board of Directors similarly given. 1. METHOD OF GIVING NOTICES Whenever notice is required to be given by these by-laws, the same shall be given as specified by depositing the same in the United States mail, postage prepaid, to the last known address of the individual entitled to such notice. Notice may also be served by sending notification to the last known email address of individuals in lieu of postal mail notification. 2. WAIVER OF NOTICE Notwithstanding the provisions of Section I of this Article VII, it shall be waived by any person who attends a meeting which is the subject of such notice, even though notice was not furnished to such person as required. 1. ASSETS ON DISSOLUTION No part of the net earnings of the corporation shall inure to the benefit of, or be distributable to, its members, trustees, officers, or other private persons, except that the corporation shall be authorized and empowered to pay reasonable compensation for services rendered and to make payments and distribution in furtherance of the purposes set forth in Article First hereof. No substantial part of the activities of the corporation shall be the carrying on of propaganda, or otherwise attempting to influence legislation, and the corporation shall not participate in, or intervene in (including the publishing or distribution of statements) any political campaign on behalf of any candidate for public office. Notwithstanding any other provision of these articles, the corporation shall not carry on any other activities not permitted to be carried on (a) by a corporation exempt from Federal Income Tax under Section 501(c) (3) of the Internal Revenue Code of 1g54 (or the corresponding provision of any future United States Internal Revenue Law) or (b) by a corporation, contributions to which are deductible under Section 170(c) (2) of the Internal Revenue Code of 1954 (or the corresponding provision of any future United States Internal Revenue Law). Upon the dissolution of the corporation, the Board of Directors shall, after paying or making provision for the payment of all of the liabilities of the corporation, dispose of all of the assets of the corporation exclusively for the purposes of the corporation in such manner, or to such organization or organizations organized and operated exclusively for charitable, educational, religious, or scientific purposes as shall at the time qualify as an exempt organization or organizations under Section 501(c) (3) of the Internal Revenue Code of 1954 (or the corresponding provision of any future United Stated Internal Revenue Law), as the Board of Directors shall determine. Any of such assets not so disposed of shall be disposed of by the Court of Common Pleas of the county in which the principal office of the corporation is then located, exclusively for such purposes or to such organization or organizations as said Court shall determine, which are organized and operated exclusively for such purposes. 2. GIFTS The Board of Directors on behalf of NARPA may accept any contribution, gift, bequest, or devise for the purposes of NARPA. 3. AUDITING OF BOOKS At least once a year, prior to the regular annual meeting of the members, the treasurer shall submit to the Board of Directors a full statement of the finances of the corporation. 4. SEAL The seal of the corporation shall be as follows: National Association for Rights Protection and Advocacy. 5. PROCEDURE AT MEETINGS The business procedures adopted by the membership at the 1985 Conference and revised October 8, 1986 shall be used for the 1986 Conference and all subsequent conferences (see Appendix A). ROBERT’S RULES OF ORDER The rules contained in the current edition of Robert’s Rules of Order, Newly Revised shall govern the procedures of NARPA in all cases in which they are applicable and in which they are not inconsistent with these bylaws and any special rules of order, which NARPA may adopt. AMENDMENT OF BYLAWS Except as otherwise provided in the Articles of Incorporation or by these by-laws, these by-laws may be altered, amended, or repealed or new by-laws may be adopted by a 2/3-majority vote of NARPA Board members. II. MOTIONS AND RESOLUTIONS A) The Business Meeting will be chaired by the President. B) The Business Meeting will receive motions and resolutions (both called "motions" below) related to substantive issues related to the mission and nature of NARPA and its work, or related to the organization itself, or amendments to its by-laws. However, any such motions and resolutions must be filed in accordance with the following provisions. C) All motions must be in writing and legible and signed by the movant and a person seconding the motion; each must be a member of NARPA. The motion or resolution must be filed at the Registration Desk by 4:00 p.m. on the day before the Business Meeting. The 4:00 p.m. deadline will be strictly enforced. All motions must be endorsed by the Secretary (or his delegate) with the time and day of filing. D) To the extent possible, all motions will be photocopied for distribution to the members at the Business Meeting. E) At the beginning of the Business Meeting, each motion will be identified orally in the order received, one after another and without any debate. However, movant shall be permitted the opportunity to speak briefly to explain the motion. An initial screening vote will then take place. Unless at least 10% of those members present are in favor of the motion, it will be considered defeated and not further discussed. All motions which survive the review under "D" above will be presented to the membership for voice vote after debate. If the results of the voice vote are unclear, the membership shall vote by raised hands. Any amendments to motions must be relevant to the nature and effect of the motion itself. The Chair shall rule on relevance. F) Any speeches in favor of or against any motion will be limited to five minutes or such shorter time set by the Chair of the meeting. No more than three speeches in favor of, and three speeches against, each motion will be permitted. Speeches on proposed amendments (no more than two on each side) will be limited to one minute. Individual speakers may not cede or share their time with anyone else. The time and speech limits in this paragraph include the movant of a motion of amendment. G) The Chair of the meeting will rule upon all matters which arise in debate and voting on motions, subject to being overruled by a majority vote of those members present. The Secretary will monitor procedures and timelines. EMERGENCY PUBLIC POLICY PROCEDURE The Board of Directors may initiate, intervene, file friend of the court briefs or otherwise participate in litigation or take a public position when such action is consistent with the Mission Statement of NARPA and any agenda or priorities which may have been adopted by NARPA. Such action shall be taken upon written or telephone notice to the entire Board, and upon concurrence of a majority of the members of the Board expressed by mail or telephone, confirmed by the President in writing to the Board and reported to the membership in the next following issue of The Rights Tenet. In an urgent situation involving litigation deadlines or other similar time limits of any official or quasi-public body, the officers (with approval of a public policy committee to be designated by the Board) are authorized to act immediately, and then follow the procedure set forth above: provided however, that if the officers and the public policy committee are not unanimous, the issue shall be sent to the entire Board, as above. Such decision by the Board shall be made by teleconference which shall be paid for by NARPA. BOARD RESPONSIBILITIES/ASSIGNMENTS Board Members should be selected on the basis of ability, involvement in activities consistent with the purpose and mission of NARPA, and a personal commitment to people who receive mental health services. (3) contribute to regular activities, including a minimum of two hours per month. (4) Assist with volunteer tasks at the Annual Conference, including registration, evaluations, presenting workshops, etc.